I saw a recent report that says that childhood obesity is still on the rise, and that has me really worried. What can I do to help my child eat healthier? Teaching kids to cook and eat healthy. You are right. According to a new report released this week, the number of children in the United States between the ages of 2 to 19 who are obese reached 18.5 percent in 2015 and 2016. That’s an increase from 14 percent in 1999, according to the study that appears in the February issue of the Pediatrics journal. Researchers studied data from the Centers for Disease Control and Prevention’s National Health and Nutrition Examination survey to come up with their findings. They also found that the percentage of children ages 2 to 5 who are obese hit nearly 14 percent during the same time period. That’s an increase from 9 percent in 1999. 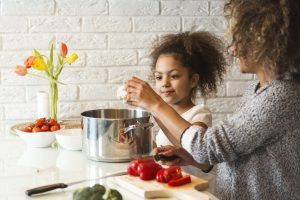 So what can you do if you are a parent or caregiver of a child and want to get them to eat healthier? You can first make sure that you serve them balanced meals and snacks that offer a variety of nutrient-rich foods, advises the Academy of Nutrition and Dietetics. You can also eat meals together as a family, which helps to improve nutrition and promote healthy weight for children, the organization says. Avoid pressuring or forcing children to eat, and allow them to signal when they are full. Offer a healthy variety of foods from different cultures. Take children to the grocery story when you shop for food and teach them information on food groups including grains, fruits, vegetables, dairy and proteins. Have children plant a garden with you and learn about how to grow fresh fruits and vegetables. Let kids help in the kitchen during meal preparation. Have healthy snacks easily available to children, including kid-sized cut up fruits and vegetables. Avoid watching television while eating. Older children can be taught to read and use the Nutrition Facts labels on food to understand what they are eating. Model what you want your children to eat. If you eat healthier foods, they can learn to develop healthy eating habits as well. Encourage children to drink more water and milk. Additionally, you should limit sugar in your child’s diet. In fact, the American Heart Association recommends that children ages 2 to 18 eat fewer than 6 teaspoons of added sugar a day. That amount is equivalent to about 100 calories or 25 grams. It’s important to note that added sugars are any sugars — including table sugar, fructose and honey — either used in processing and preparing foods or beverages, added to foods at the table, or eaten separately. The American Heart Association also estimates that calories needed by children range from 1,000 a day for a sedentary 2-year-old to 2,400 for an active 14- to 18-year-old girl and 3,200 for an active 16- to 18-year-old boy. Editor: This column was reviewed by Carolyn Gunther, state specialist in Community Nutrition for Ohio State University Extension.